MPSolve stands for Multiprecision Polynomial SOLVEr. It is a software that aims to provide an easy to use (hopefully) universal blackbox for solving polynomials and secular equations. Guaranteed inclusion radii for the results. Exploiting of polynomial structures: it can take advantage of sparsity as well as coefficients in a particular domain (i.e. integers or rationals). It can be specialized for specific classes of polynomials. 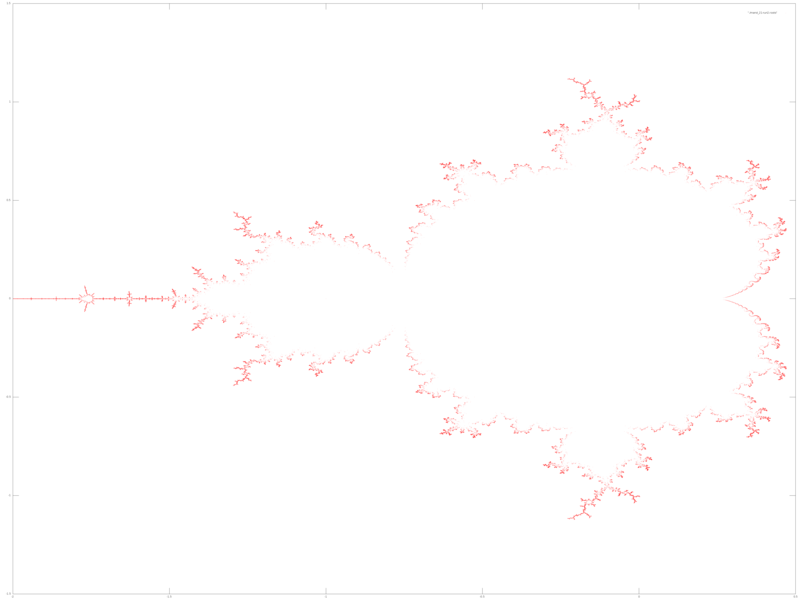 As an example, see the roots of the Mandelbrot polynomial of degree 2.097.151 computed in about 10 days on a dual Xeon server. If you have installed MPSolve you can read the documentation to see how to specify polynomials. Bini, Dario A., and Robol, Leonardo. Solving secular and polynomial equations: A multiprecision algorithm. Journal of Computational and Applied Mathematics 272 (2014): 276-292. The easiest way to use MPSolve is to use a prebuilt binary version. Additional modules (such as Octave and Python bindings) can be installed with the packages octave-mpsolve and python-mpsolve. An installer for Windows can be downloaded from the Downloads page. You can grab the older release tarballs on the Downloads page. where x.y.z stands for the version of MPSolve that you have downloaded. You may want to skip the last command if you don't want to install the package on the machine or simply don't have administrator privileges. In that case you can use ./src/mpsolve/mpsolve in place of the mpsolve command that you find in the documentation. For more advanced instructions on how to build MPSolve, see the page Building MPSolve. MPSolve ships with an executable file, called mpsolve (or mpsolve.exe, depending if you are using Microsoft Windows or not) that can be used to solve polynomials given a file that represent their coefficients. Some example polynomials can be found in the directory src/tests/unisolve/ while some secular equations can be found in src/tests/secsolve. For further documentation on how to write an input file, see the section on Polynomial Files. Other options for MPSolve can be used to tweak the resolution settings, such as the number of digits required in the output and desired target to reach before stopping (i.e. isolate the roots, approximate the roots or count the roots). A list of all the possible options can be seen with the command mpsolve -h.
From version 3.1.0 MPSolve has a graphical user interface that you can use launching the command xmpsolve, or ./src/xmpsolve/xmpsolve from the source folder. Note that the user interface will be built only if you have the required development packages, namely libqt4-dev or libqt5.